Mama’s birthday was August 11. This is the first birthday since she passed away last October. She would have been 77 today! I chose to post this picture today, because Mama seemed to have nice childhood memories- especially when she lived in Cambridge, MN, which is where I think this photo was taken. The girl holding the baby is my mom. I think she is about 10 or 11 years old, so this would be around 1940-41. The little girl is her sister, my Aunt Beverly. 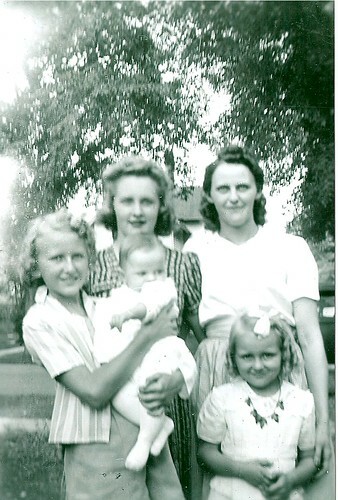 The dark haired lady is my grandma, Hazel Wickstrom. I don’t know who the other lady or the baby are!